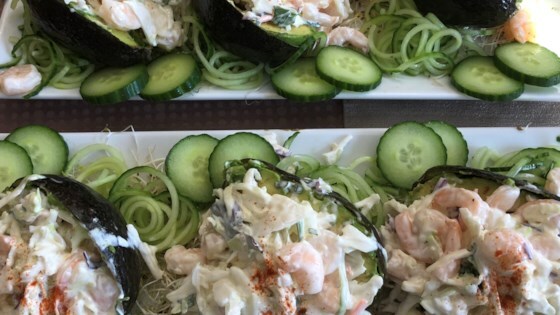 "Avocado halves are filled with a delicious mixture of shrimp, crab, and cucumber. A wonderful beginning to a light lunch, or a great appetizer for an elegant dinner!" In a bowl, mix the crab, shrimp, cucumber, mayonnaise, and parsley. Season with salt, and pepper. Cover, and chill until serving. Slice the avocados lengthwise, and remove the pit. Scoop out the flesh of the avocado, leaving about 1/2 inch on the peel. Spoon the seafood mixture into the hollowed centers of the avocado halves. Sprinkle the tops with paprika. Not very good, I just really didn't enjoy this.